Lemon curd is one of my favorite treats – partly because it’s obviously to die for and partly because it brings to mind great childhood memories. Every summer until I was about 12, we would vacation in the South of England, near Brighton (Shoreham-by-Sea, if you’re familiar with the area!). We drove up to the north of France and then crossed the sea by boat. This was so exciting! And one of the things we loved to eat there was…lemon curd! My mom was absolutely crazy about it, and she passed this addiction on to me. Back then, we couldn’t find any in France so we would stock jars to have at least a few months of supplies. Little did I know at the time that it’s really easy to make at home! Step 1 – Mix eggs, egg yolks, coconut oil and honey together with a fork. Step 2 – Add coconut flour, and mix until a dough comes together. The dough might take a minute to form and will remain wet, it’s normal. As long as you can form a ball with it, you’re good to go. Step 4 – Using your hand, spread the dough as evenly as possible. It doesn’t have to be perfect but make sure to form edges high enough so the filling doesn’t spill out. Step 6 – Bake until golden brown. Pay attention to the crust because all ovens are different and it can go from golden brown to burnt quickly! Now for my favorite part, the dairy-free lemon curd! 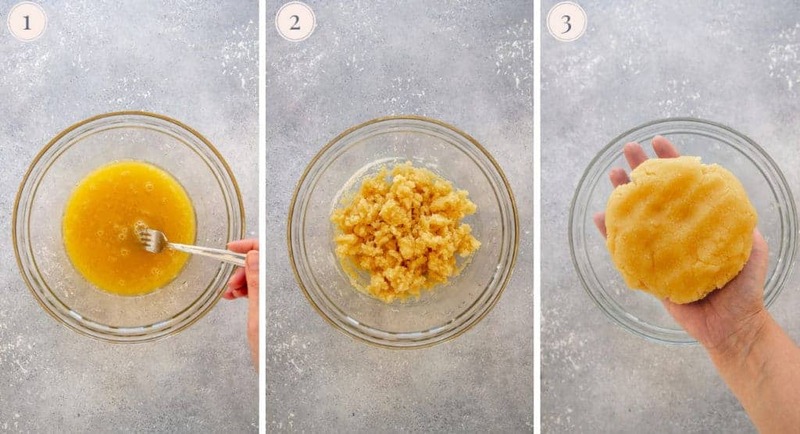 Step 7 – Whisk together all the curd ingredients: eggs, egg yolks, honey, lemon juice, lemon zest, coconut oil and a pinch of salt. Step 8 – Cook on medium-low heat for about 15 minutes. When it starts bubbling (around 5 minutes), whisk very often to avoid lumps. The curd should coat the back of a spoon. Don’t worry, it will be too liquid for now but will thicken as it cools. Step 9 – For a perfectly smooth lemon curd, press it through a sieve set up over a bowl. Step 11 – Shake the pan gently until the filling is well distributed and smooth at the top. Step 12 – Put in the fridge for at least two hours to let the curd settle and thicken. And there you have it, a creamy, beautiful lemon curd tart ready to be served! If you’re making it ahead or have leftovers, store it in the fridge. Can you taste the coconut in this tart? Since the crust is made with coconut flour and the lemon curd with coconut oil, it’s a legitimate question! The answer is: no, unless you want to! Coconut flour has a very mild taste so you won’t get a coconut flour from the crust. My favorite coconut oil brand, Nutiva, carries both sorts. You can shop them here. For a beautiful presentation, you can also top your tart with sliced strawberries and/or sliced lemons. 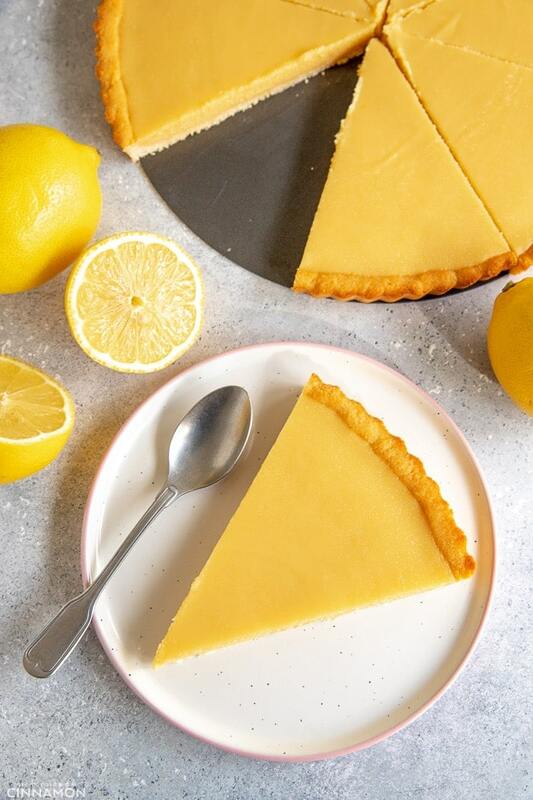 This 5-ingredient paleo lemon curd tart features a rich lemon filling and a golden coconut flour crust – a healthy dessert that everybody will love! the zest of 4 lemons Tip: zest the lemons before juicing them! Start with the crust. In a large bowl, add melted coconut oil, eggs, honey and a pinch of salt. Mix with a fork. Add coconut flour and mix until dough forms and holds together. It will seem too wet at the beginning but keep mixing; the coconut flour will absorb a lot of the moisture quickly. The dough will stay wet but you should be able to form a ball with it. Gather dough into a ball and flatten into a disk. 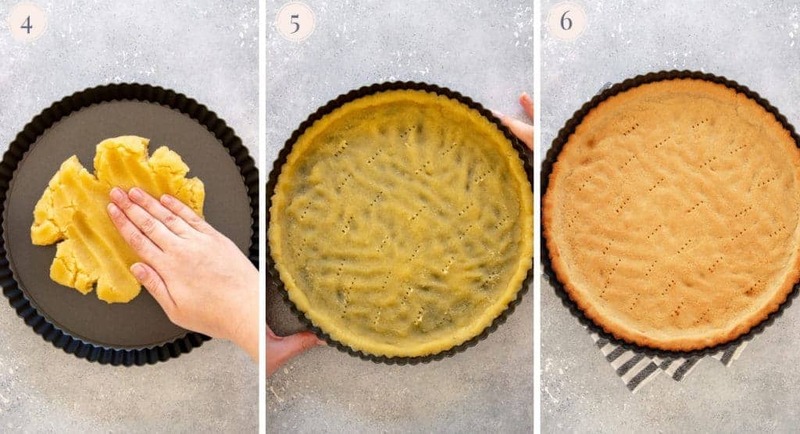 Transfer to a 12-inch (30 cm) tart pan with a removable bottom. Using your hands, spread dough in the pan, as evenly as possible, pressing into edges. 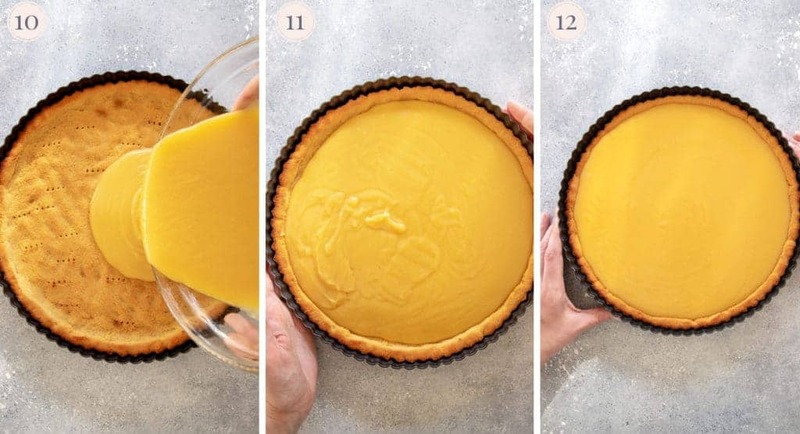 Make sure the edges are high enough (about 0.5 inches – 1,5-2 cm) so the filling doesn't spill. Prick bottom with a fork and bake for 9 minutes or until golden (all oven are different so keep an eye on the crust to make sure it doesn't burn). Remove from the oven and set aside. While crust is baking, prepare lemon curd. In a small pot, whisk together eggs, egg yolks, honey, lemon juice, zest, melted coconut oil and a pinch of salt. Cook curd on medium heat until it thickens and coats the back of a spoon, about 15 minutes. Whisk often and once it starts bubbling (about 5 minutes), start whisking constantly. It's normal if the curd isn't super thick and not curd-like yet. It will thicken when cooling. 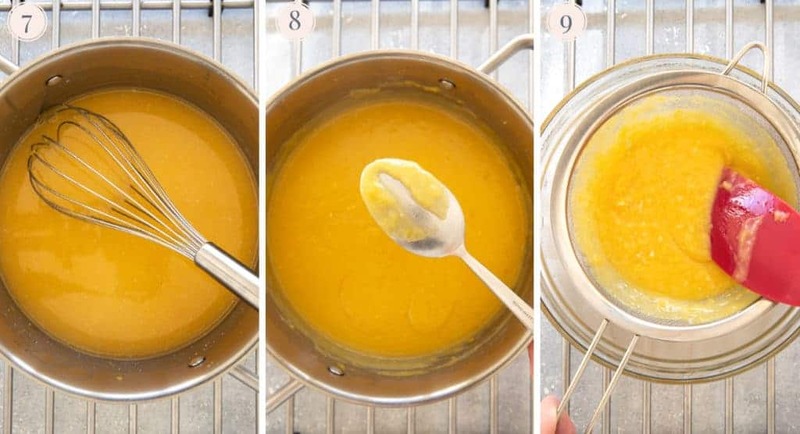 Place a sieve over a bowl and pour lemon curd to strain it. Use a spatula to help press it through the sieve. Give the curd a stir and pour it onto prepared curst. Let it cool slightly and refrigerate at least two hours to allow the curd to set. Remove tart from the pan (I usually keep the bottom and remove only the side), cut into slices and serve. Keep leftovers in the fridge. 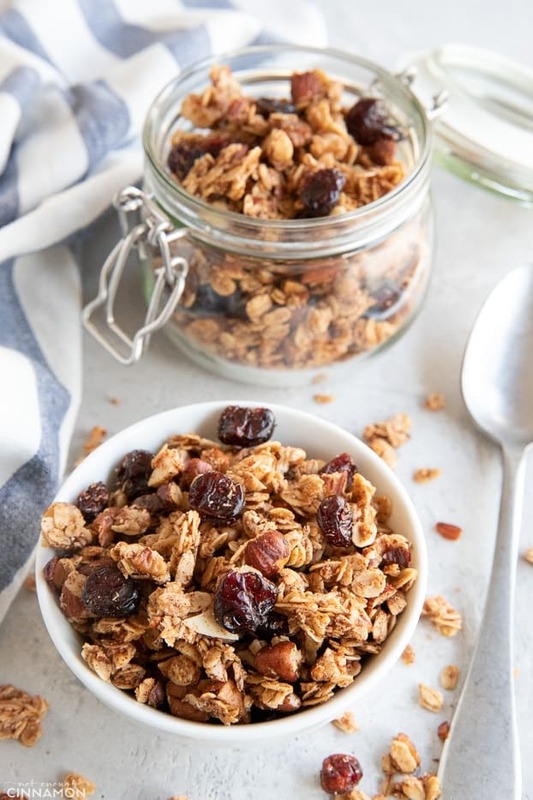 IMPORTANT NOTE: This recipe was originally posted in 2012 and updated in March 2019. If you read the comments, DO NOT DOUBLE THE FILLING, it's already done in the updated recipe! MAKING AHEAD: fresh is always best but this tart keeps well in the fridge for up to 3 days. FLOUR SUBSTITUTIONS: I unfortunately don't know if you can use almond flour or any other type of flour because I haven't tested it for this specific recipe. If you'd like to substitute the coconut flour, I would suggest finding another crust recipe and only making the filling. If you tried this tart, don’t forget to rate the recipe below and let me know how it went in the comments – I love hearing from you! You can also follow me on Instagram, Pinterest and Facebook for more deliciousness and behind-the-scenes! UPDATE NOTE: This post was originally published on October 10, 2014 and republished in March 2019 with an updated recipe, new photos and more tips. 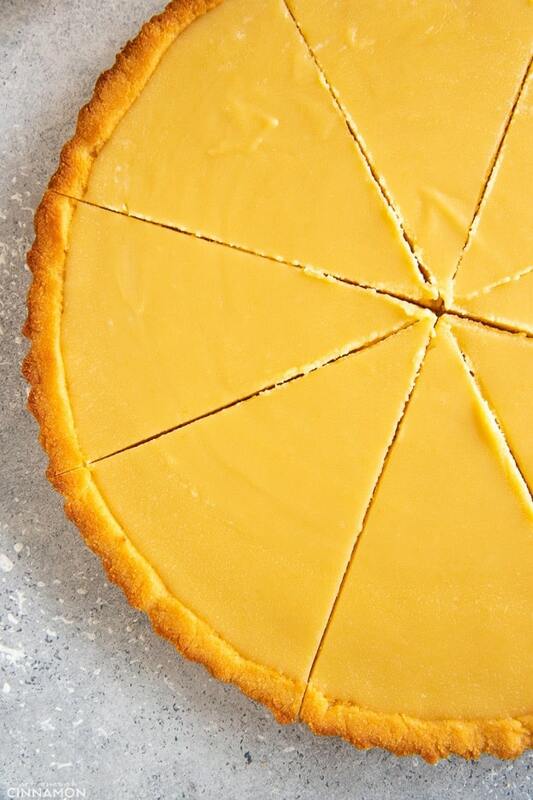 I try to eat and cook paleo as often as possible so this lemon curd pie is perfect for me. Thanks for sharing the recipe! Pinned! 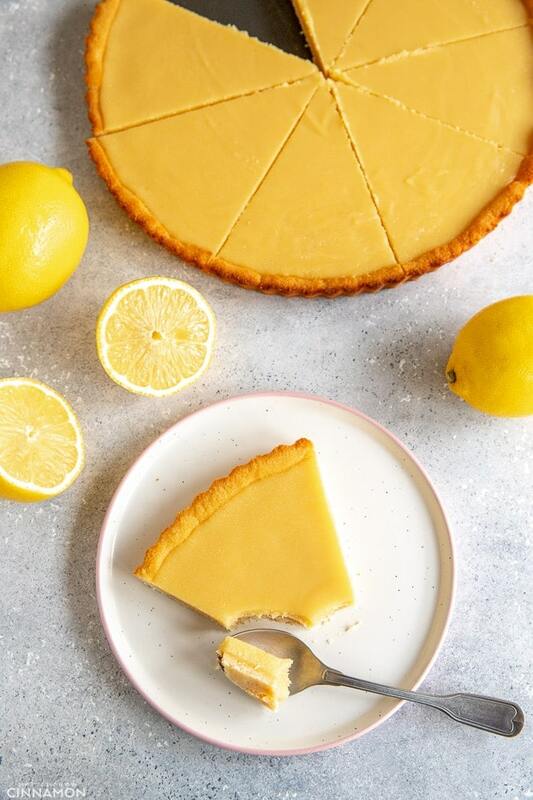 Oh my sparkles paleo lemon curd tart for real! Can’t wait to try this one 🙂 might save it for those depressing middle of winter days. Thanks Chantelle and good luck with your winter!!! I tried to comment on your blog but couldn’t. Your banana bread looks so delicious!! can I use almond flour instead a coconut flour? Hi Beata, unfortunately I don’t think it would work with almond flour no. You should really stick to coconut flour. Sorry! Lovely recipe! But you certainly can use almond flour to make a beautiful pre-baked shell for this and many other fillings. There are hundreds of such recipes you can find through google. 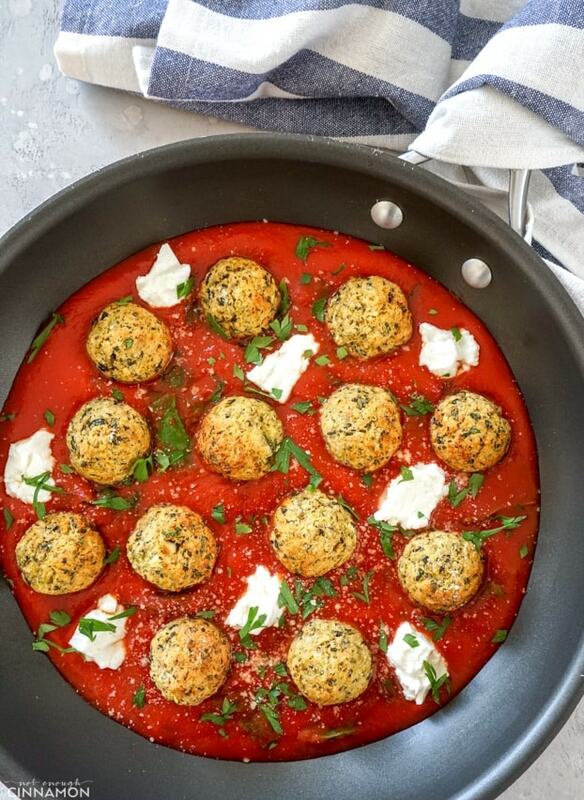 So happy you enjoyed this recipe! I doubled the recipe for the curd filling and it’s perfect. Haven’t yet taken a bite but I did try what was left in the pot and it was delicious! 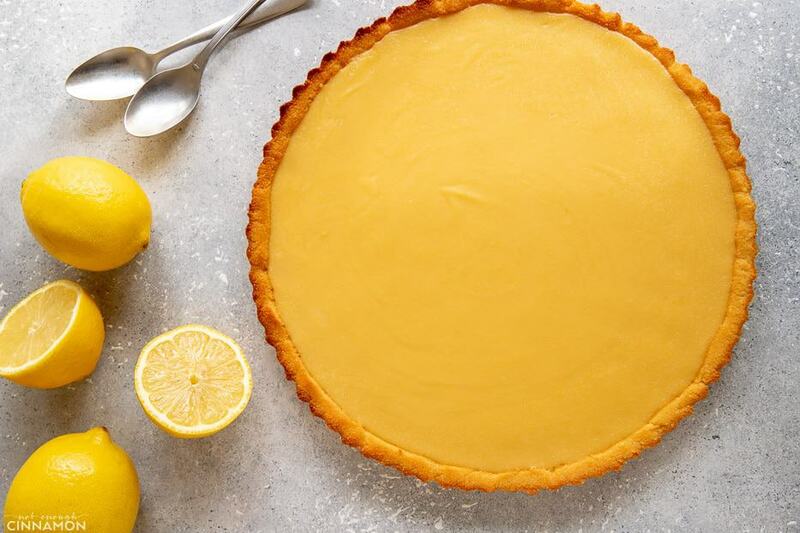 Can’t wait to make this – my daughter is nuts over the gluten free vegan lemon curd tartlets at Pips Place in NYC – but we live 1500 miles away from there…I will try however to use an entire lemon in the curd, liquefied first in high speed blender, to keep to the original Whole Foods ideal of Paleo. The white part of the lemon is the part we throw away, so evident with this recipe, but it contains serious nutritional treasure 🙂 Thanks, keep em coming! Think you could add meringue to this for paleo lemon meringue pie? Definitely! 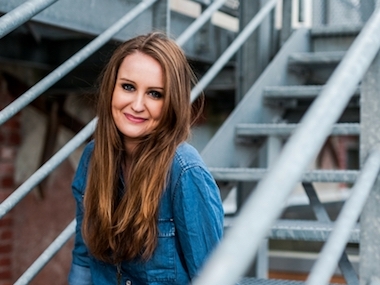 But I’m not sure how to make a paleo meringue though… You could maybe try this recipe? wow, wow, WOW! I made this for Easter dinner, took advice from one comment and doubled the filling… unbelievable! Just follow the recipe and this one is sure to please any palette. I just finished making this. Now the painful wait while it sets ha ha! I plan on making a whipped cream topping from coconut milk sweetened with honey. I know, it’s hard!! How did you go with the whipped cream with coconut milk? I still haven’t mastered this one! Can you taste the coconut in this? If you use refined coconut oil (instead of unrefined) you won’t taste the coconut at all! It’s funny how pregnancy cravings work! But if you ask me, it’s a pretty good craving to have haha 😉 Hope you enjoyed the recipe Heidi! Will wholemeal spelt flour work? I haven’t tried with this recipe and never cooked with spelt flour before so I don’t know. Sorry I couldn’t help you more! I was so excited for this recipe – it’s been cooling in fridge for laser 4 hours and is still runny when I cut into it! Any special instructions that I could have messed up? I followed direction exactly… Only maybe I didn’t cook on stove long or high enough? About 8 min– should it have been bubbling? Hi Jess, I understand your disappointment! From what you’re telling me, it sounds like you haven’t cooked the curd long enough. With my stove it takes about 8 minutes but it’ll probably vary a little from stoves to stoves, so keep cooking it until you get the right consistency. It will then set even more when refrigerated. I hope you’ll give it another go! I am planning on making this for EAster…just wanted to check and see if I could make it today and keep it in the fridge for tomorrow? Can’t wait to try this! You can definitely make the lemon curd ahead, but I would prepare the dough on Sunday to make sure it’s not soggy. Enjoy!! I have been super excited to make this for Easter! The curd tastes delicious. 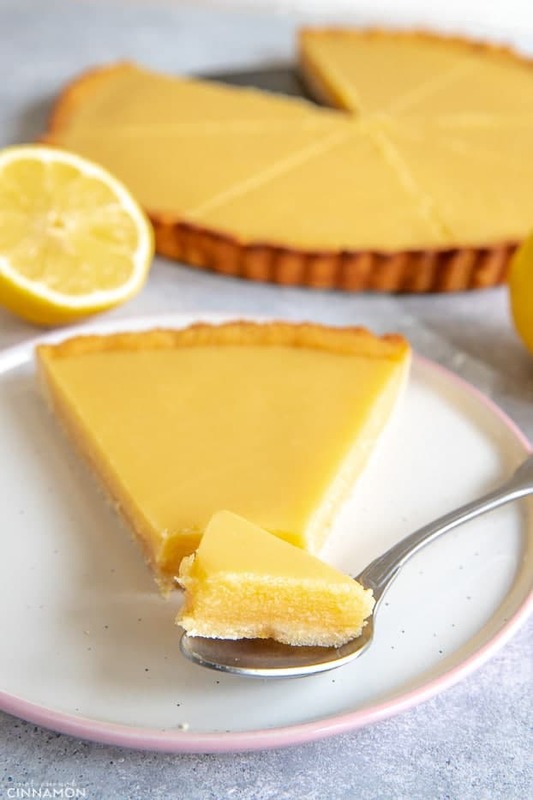 I do find it quite frustrating that one needs to scroll through 30 comments to find out that 1) you really need to double the lemon curd as the tart will not be full as written and 2) that you shouldn’t make it ahead. These are important pieces of information I’d like to have seen in the recipe. Fingers crossed that it still tastes great tomorrow. Hi Cheryl! I’m excited you made this for Easter 🙂 Some people have doubled the curd to make the pie extra delicious but when I make it, I follow the recipe as written (and that’s what’s pictured). I’ve never eaten the whole pie in a day so I know it’s still good a day or two after. I just recommended that to Sandy to be on the safe side and make sure it’s extra fresh. But don’t worry, I’m sure yours will be delicious as well! Looking forward to hear what you think 🙂 Happy Easter! Think I can sub in lime?! I’ve never tried but yes, it should work! Oooh girl, I’d totally do the same lol. So glad to know it works with limes as well! Thanks Merannda! Will thiss pie still be good the day after? It’s better the same day but it’ll still be good the day after. The crust will just be a bit softer. Mine has been in the fridge for several hours, but it’s not setting. Any tips? I am all about the lemon desserts at the moment – they are perfect for spring. This looks amazing and fresh. LOVED this recipe! 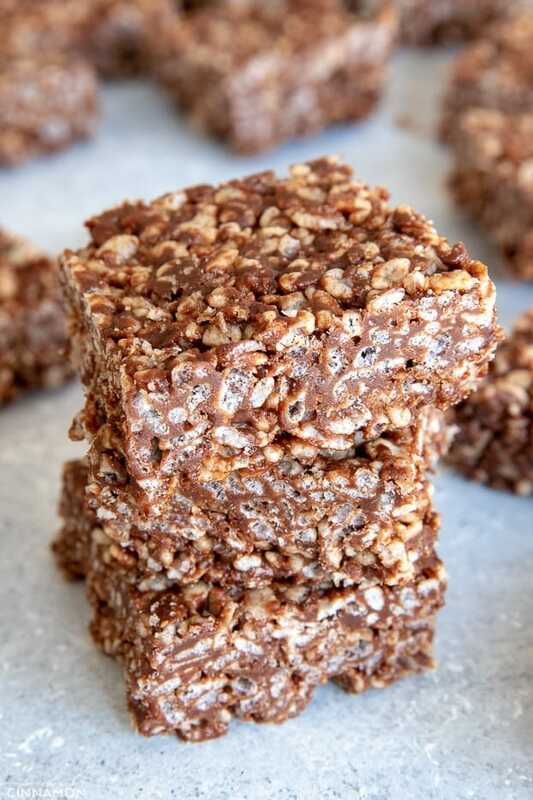 I’m always looking for Paleo desserts to take with me to dinners and potlucks. It turned out perfect! Thanks! Yay, so happy you loved this tart Mary! Thank you!! This tart turned out such a beautiful colour and I love the coconut crust. This pie looks really tasty. I can’t believe it’s Paleo! I’m pinning this recipe for the weekend. No one else in the family is Paleo, but I think they’ll like it anyway. I’ve made this so many times to friends and family who don’t know the first thing about paleo and everyone loved it! You were right, couldn’t taste the coconut at all! This lemon curd curd tart was delicious! Awesome, thanks so much Lisa! Can you sub the honey? Of course I have all the ingredients but the honey! You could use sugar but it wouldn’t have the same nutritional profile at all.